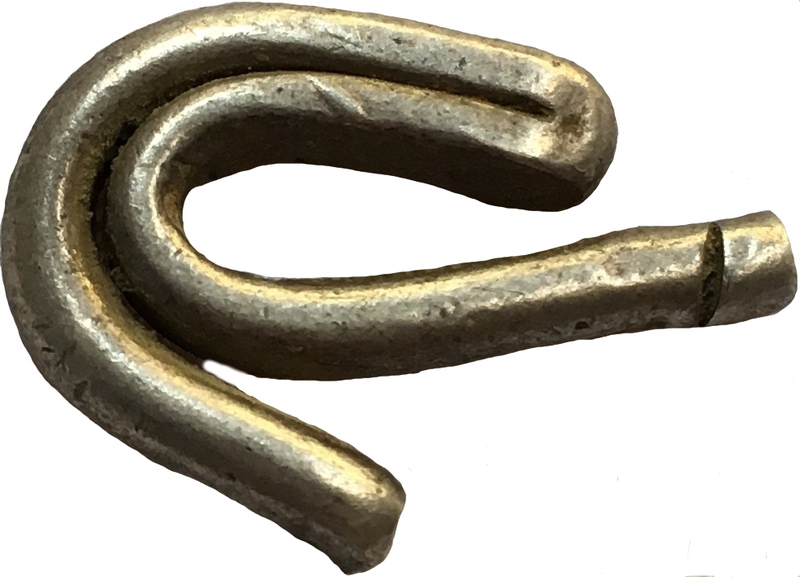 Inscrption on flattened sides of the hook. The Larin, also known as koku ridi was in use in Kandy from the 16th to early part of the 19th century were made by private parties, the Larin was traditionally traded at 5.5 Lari to the Spanish colonial piece of eight. the Larin was traditionally traded at 5.5 Lari to the Spanish colonial piece of eight. Larins often show one or more cuts, apparently made to test the purity of the metal. During the Portuguese period larins enjoyed widespread use in Ceylon. The silver larin coinage, which originated in the Persian Guff, was used extensively from that region around the coast of the Indian Ocean as far as Lanka during the period 16th and 17th centuries. Larin's at the beginning are a piece of silver wire with about 10 centimeters length, usually folded in two equal parts and shaped like a C. There are also lari shaped like a J, an I or S. Genuine Lari were stamped with an Arabic or Persian text, bearing the name of the local ruler. The “I” was apparently most popular among the Arabs and Persians, while the J and S shapes were typical for the island of Ceylon. "There is another sort (of money), which all People by thr king's Permissin may and do make. The shape is like a fish-hook, they stamp what mark or impression on it they please. The silver is purely fine beyond pieces of Eight. For if any suspect the goodness of the Plate, it is the Custom to burn the Money in a fire red hot, and so put it in water: and if it be not then purely white, it is not Currant Money." "The King of Kandy has introduced in the island of Ceylon a kind of money, which consists of a piece of silver wire rolled up like a wax taper. When a person wishes to make a purchase he cuts off as much of this silver as is equal to the price of the article." Page 164 Chapter XII Muhammadan - Plate 163.